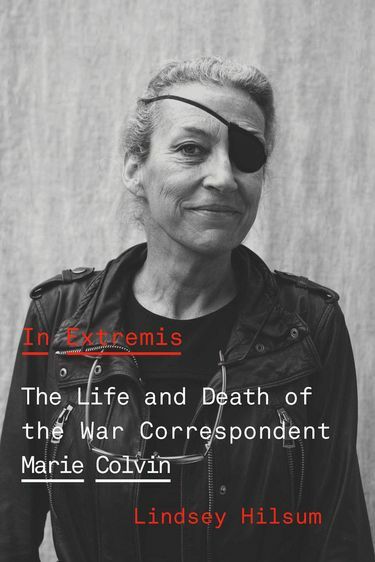 A new book chronicles the life and death of journalist Marie Colvin. On a short assignment in Libya in the fall of 2011, I caught a glimpse of foreign correspondent Marie Colvin at the Radisson hotel in Tripoli. I noticed the black patch on her left eye first. But there was something more that made me pause. The previous month, rebels seized the capital from the forces of Libyan leader Moammar Gadhafi, and journalists had turned the hotel into a kind of media center. Anvil cases of broadcasting equipment clogged the corridors; correspondents and crews hustled from room to room writing dispatches and doing TV live shots. In that adrenaline-charged atmosphere, Colvin seemed like her own force field, radiating energy but centered, as if she just belonged there. After three decades of reporting on all of the major conflicts of our time — Afghanistan, the Middle East, Iraq, Lebanon, Bosnia, Sri Lanka, Libya, Chechnya — Colvin was at home in war zones, but she knew there was a price to pay in physical hardship and her personal relationships for a life chronicling human suffering. Five months later, at age 56, she died in an artillery attack in Homs, Syria — deliberately targeted, her family and fellow journalists say, by the Syrian military. In this magnificent and moving biography, “In Extremis,” Lindsey Hilsum, international editor for Channel 4 News in Britain, captures the clashing extremes of Colvin’s life: a disciplined journalist who often missed deadlines; a woman of extraordinary courage tortured by personal insecurity; a role model for aspiring journalists who, when the assignment was over, often drank herself into a stupor. This is not a hagiography. Hilsum drew on a variety of sources to create her portrait: Colvin’s articles for the Sunday Times of London, emails, faxes, interviews with her by other journalists, books by other journalists, her own interviews with more than 100 people who knew or encountered Colvin, and — most important — more than 300 journals Colvin kept from 1969, when she was 13, until January 2012, a month before she was killed. A course in nonfiction writing at Yale taught by John Hersey, the Pulitzer Prize-winning author, changed her life. One of Hersey’s most famous works, “Hiroshima,” a nonfiction account of the atomic bombing of that city, originally published in The New Yorker, describes in searing detail the lives of six people on the ground the day the bomb was dropped. The sad irony was that Colvin’s editors believed it was precisely her passionate, on-the-edge reporting, for which she sacrificed personal peace and risked her life, that sold more papers. Eight years before she was killed, the executive editor at the Sunday Times suggested she stop reporting from war zones, return to London and become a columnist. She began seeing a psychiatrist and seemed on a path to recovery, yet she was consumed with anxiety and self-doubt. She went back to drinking and to war zones — Afghanistan, Libya, Syria. The rebels opened fire with a rocket-propelled grenade. A chest wound almost killed Colvin, and shrapnel hit her eye. The rebels rushed her to a hospital where doctors saved her life, but they could not save her eye. Reading this book is painful. I thought about her and about other war correspondents with whom I’ve worked. At the end of my brief assignments, I always went home. For them, something in that chaos, and pain, and horror, kept pulling them back.